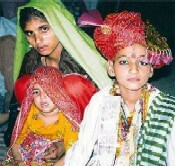 Child marriages were not only prevalent in those days but also had social sanction. 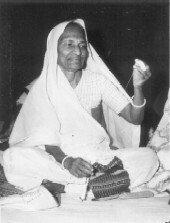 Jankidevi broke the blind tradition. She put an end to opulent weddings and conducted them during the day so as to curtail unnecessary expenses and vehemently opposed child marriages. With other ornaments Jankidevi put on a golden chain (Tagdi) under the waist. In those days, wealthy men too had the practice of wearing tagdi and other types of chains, etc. 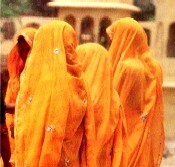 Women were particular in observing the custom. At the instance of Jamnalalji, Jankidevi stopped wearing a tagdi when she was thirteen and stopped the custom in her house too. Then a day came when Bapu told all the Ashram sisters to stop wearing ornaments. In 1921, Jamnalalji then wrote to Jankidevi informing her of Bapu's direction not to wear any ornaments. She kept the letter in front of her and took off all her ornaments. She also took off the anklet, which even the poorest of the poor Marwari woman has in her foot right until her death. She wholeheartedly accepted her husband's dictum that 'gold represents the devil... gives rise to jealousy...' and distanced herself from rich living. She also freed the idol of God in her temple of all gold and precious stone ornaments. She remained true to this faith right to the end and always encouraged women to free themselves from the attraction of gold. The rising attraction of gold even among the educated women of today, bears ample testimony to the greatness of the willing denial she exhibited then. 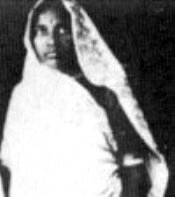 In 1921, Shri Jamnalalji told Jankidevi, quoting Gandhiji, 'Foreign clothes are like a demon in our country and this evil has to be driven out...' She immediately understood the far-reaching consequences of this idea and removed each and every foreign garment from the house, the family, the temple and everywhere and burnt them all in front of her house (Gandhi Chowk) in Wardha. There were so many clothes that the fire raged for 7 days. Her action of giving up the comfort was an example for the whole country to follow and thereafter everywhere in the country people started boycotting foreign clothes. Jankidevi herself traveled to the farthest corners of the country and spread the message. In those days harijans were considered untouchables. Let alone the touch, even their shadow was considered as impure. Jankidevi was also brought up in the same atmosphere. However Jankidevi fully supported Jamnalalji's programme of admitting harijans into homes. There was a big temple of Laxminarayan erected by the Bajaj family in Wardha. Under inspiration from Gandhiji, Jamnalalji on 17th July 1928, opened this temple to harijans under Vinoba's leadership. Jankidevi exhibited complete commitment to the programme. Thus this was the first temple in the country to freely admit untouchables. Till today the idols in the temple are clad in Khadi clothes. No gold or precious stones ornaments are adorned on the deity and prasad is strictly made from cow's milk only. People of all faiths, castes and classes come with the same devotion to the temple for a blessing. Joining the membership drive of the Congress, Jankidevi went to the homes of harijans and made them members, thus bringing them into the mainstream of the freedom struggle. After Bapu and Jamnalalji were released from the jail, a countrywide programme of Bapu visiting the harijans was drawn. Jankidevi sent her second daughter Om with them who remained with Gandhiji for almost one year. In order to set an example for the society, Jankidevi shunned the superior soft Khadi from Andhra Pradesh and always put on inexpensive thick Khadi clothes. The thick Khadi scratched the tender skin of the children in the family, but Jankidevi did not deter. The clothes might have become softer if they were washed at the Dhobi's hands; but fearing that this would make the clothes tear, Jankidevi refrained from doing so. She was so impressed by the first sight she had of Bapu in Mani Bhavan, that she not only started using a Charkha herself; but also procured sixty Charkhas at her home and started a Charkha class. She constantly worked for the promotion of Khadi. When she realised that without a good cotton ball, the Charkha user looses interest; she arranged for cultivation of good quality of cotton. She herself went with her children and the servants to select cotton. Her Commitment to Khadi continued till the very end. She was not just devoted to Khadi, but she made the Charkha an important part of the Swadeshi movement. In this connection she went to the far corners of Kolkata and rural Bihar and worked for the promotion of Khadi. Volunteers started agitating on 18th March 1923 when Gandhiji was arrested. A procession was taken out in Nagpur in memory of the Jalianwala slaughter and the satyagraha began on 18th May. After a short time, Jamnalalji was arrested. Jankidevi actively cooperated in this venture. She started taking part in the protests before the toddy and liquor shops herself, becoming one of the preindependent women freedom fighter. From Kolkata she went to Bihar to bring about awareness regarding the freedom struggle. She visited 45 villages in one month and conducted approximately three meetings in each village. She simultaneously carried on her work of promoting khadi and abolishing parda. Her daughters Kamla and Madalsa accompanied her. The satyagraha agitation again became sharper when the second round table conference, which was held in 1931, failed. Jankidevi's zeal was unbounded. Her extraordinary influence enabled her to collect a number of women ready to go to jail at a short notice. She was like a mortal enemy of the foreign rulers. She was imprisoned for six months and the unperturbed Jankidevi spent the time in Wardha and Nagpur jails. She showed her will-power by calling the prison as a king's abode. It also showed her capacity to face every circumstance and adversity with determination. Her wealth in Wardha was forfeited, she was fined; but that did not deter Jankidevi. She lost her husband Jamnalalji in 1942. Her daughter-in-law Savitri, son Ramkrishna, all were active in the 'Do or die' agitation started by Bapu. Her son-in-law Sriman Narayan was arrested. Jankidevi continued to fulfil the constructive enterprises left behind by her husband and went on supervising the movement with her active participation right upto independence. In ancient times, it was women like Gargi, Maitreyi, Gayatri, Sulabha, etc who influenced the society with their brightness and capabilities. Woman power is very potent. She is the mother of the human race. She is the epitome of compassion, duty and selflessness. Widows had a low social standing in those days. They were considered as harbingers of ill luck and were prevented from taking any lead in such auspicious functions as weddings, etc. Shantabai Raniwala became a widow when she was a child. Jamnalalji and Jankidevi called her as their daughter. They took her to all auspicious functions like weddings, etc. When an idol was installed in the Laxminarayan temple in Wardha, the first arti was performed at the hands of Shantabai Raniwala and the establishment of Mahila Ashram for women's education was entrusted to her. Could there be a better example of upliftment of woman? She kept her widowed sister-in-law and her children in her own house with all dignity and respect. On 30th September 1941, Jamnalalji had formed the Goseva Sangh for the purpose of serving the cause of cows. He had organised a goseva sammelan, which added a new chapter to the work. After Jamnalalji, Jankidevi carried on with his work. At Gandhiji's insistence she became the Goseva Sangh President. Jankidevi donated the sum of two and half lakh rupees left to her by her husband to Goseva Sangh and chose the life of renunciation. "Gomata has always been revered and cared for in India. Because of her India has always seen a bounty of milk and milk products. Bulls have helped till the land and have brought about a plenty of foodgrains. "Gomata has always been revered and cared for in India. Because of her, India has always seen a bounty of milk and milk products. Bulls have helped till the land and have brought about a plenty of foodgrains. Gomata cares for all. Dhartimata gives birth and Gomata nurtures. Wear khadi, keep a cow! This is the real service which will bring prosperity to the nation." Her innate love for animals gave her the courage to stop a moving cart in its tracks and upbraid the rider who was mercilessly using spurs and goads on his beast of burden. On 18th April 1951, Vinobaji started a novel bhoodan movement in order to provide land to the landless. He traversed the entire country on foot and Jankidevi actively contributed by word and by deed. In the year 1953, she then initiated an extremely appropriate 'koopdan' scheme by digging wells for irrigating the fallow land received in bhoodan and made herself busy in 'collecting wells'. Jankidevi went from house to house in the sun during the hot summer months of Bihar and urged the womenfolk to donate gold for the noble cause of Koopdan. Being firm in conviction, alert towards goal and unrelenting in efforts, Jankidevi was successful in this difficult task too.